Since 20th July 2011, United Nations has declared famine in six regions in Somalia, as a result of prolonged drought after the rainy season in the preceding year. 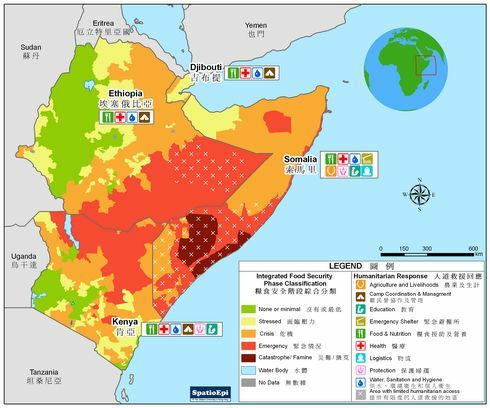 The map shows the estimated food security in September, 2011 and humanitarian responses in the Horn of Africa. As depicted by graduated colours, southern Somalia is facing the most severe food insecurity. The food security in other areas in the Horn of Africa is also in crisis or emergency. Unfortunately, humanitarian access is limited in southern Somalia and eastern Ethiopia due to conflicts. More than 200,000 Somalis have fled to refugee camps in Kenya or Ethiopia, which are located next to the border of Somalia, for medical care, food, safe water and other necessities since January 2011. Prevention of infectious diseases such as measles and malaria poses a significant public health challenge in over-crowded refugee camps. Data for the map were obtained from Famine Early Warning Systems Network, United Nations Office for the Coordination of Humanitarian Affairs and High Commissioner for Refugees. Lives and health of millions of people worldwide are threatened by natural hazards, conflicts and other emergencies annually. In the aftermath of these disasters, humanitarian assistance is needed for saving lives, alleviating suffering and maintaining human dignity. Humanitarian assistance is provided on the basis of principles including humanity, impartiality, neutrality and independence. Humanitarian aid workers help people all over the world, often risking their lives in remote, difficult or hostile place. World Humanitarian Day is observed on 19th August for honouring humanitarian workers and thanking them for their dedication. It also recognizes the sacrifices of humanitarian workers, celebrates “people helping people” and inspires the spirit of aid work.